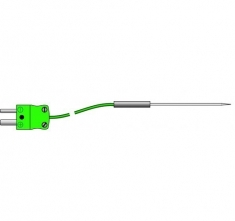 Miniature Temperature Probe - This miniature needle temperature probe is strong and versatile. It is deal for measuring a wide variety of applications including liquids and semisolids. It has an ultra fast response time of less than one second due to the reducing profile tip, which has a diameter of 1.4mm, reducing to 1mm. Probe length is 50mm, maximum probe temperature 250°C. Suitable for use with any ETI thermometer having a thermocouple socket.